Glaucoma, which refers to a group of eye diseases that damage the optic nerve, is often called 'the silent thief of sight'. This nickname evolved because the disease creeps up unnoticed in its early stages, causing no pain and few, if any symptoms. However, if left untreated it is progressive and irreversible and ultimately leads to blindness, usually affecting peripheral vision first. 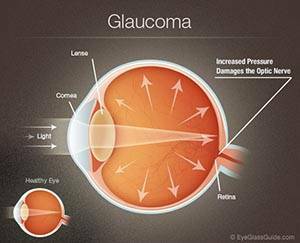 Glaucoma causes damage to the optic nerve (the nerve that connects the eyes and the brain) usually as a result of increased pressure in the eye. Early stages of the disease diminish peripheral vision. If the disease is not controlled, glaucoma often eventually causes total blindness. The best way to detect glaucoma is through a dilated eye exam. The eye doctor views the optic nerve for signs of glaucoma. Intraocular pressure (IOP) is also measured, although this measurement is not enough to determine glaucoma, as it can fluctuate even throughout the day, and it is possible to have glaucoma even if IOP falls within the normal range, or to have high pressure without glaucoma. 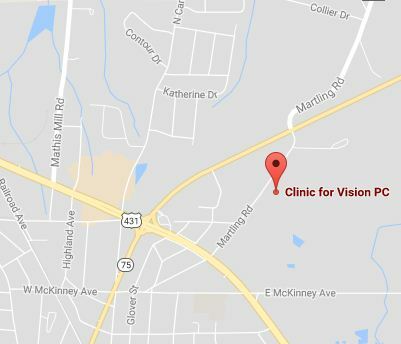 If the disease is suspected, further testing will be done, which may include visual field tests and digital retinal scanning. Glaucoma can be controlled through a variety of approaches designed to lower and control pressure build up in your eye. Treatment can involve the use of medicated eye drops. Laser procedures and minor surgical procedures can be used depending on the type and stage of glaucoma. The best way to prevent vision loss from glaucoma is through early diagnosis so make sure to schedule a complete eye exam with your eye care professional at least once a year. Don’t be the next victim of the silent thief of sight. Speak to your eye doctor about your risk of glaucoma today.